Tastes of the sea, roasted vine-ripened tomatoes and the tangy-fruity blend of chilli and feijoa and mango… another magical blend of flavours from Amanda Laird of the New Zealand Herald… I really can’t wait to see what she is doing with feijoa this season. Combine the first eight ingredients in a bowl and leave to rest for two hours. Turn oven to 200°C, roast whole tomatoes for 20 minutes. Heat oil and fry prawns quickly, tossing, for no longer than 3 minutes. Serve with the salsa and tomatoes. An adventurous fusion of autumn flavours from one of my favourite Kiwi food writers, Amanda Laird of the New Zealand Herald. Preheat oven to 200°C. Drizzle the pumpkin with olive oil and season. Arrange in a baking dish and cook for 15 minutes. Peel the feijoas and halve. Add to the pumpkin with the bay leaves and continue to cook for a further 15 minutes or until both the pumpkin and the feijoas are soft and caramelised. Turn the oven up to 220°C. Make 4 small but deep incisions into each cutlet with the point of a sharp knife. Insert a piece of garlic with a piece of anchovy into each incision. Season each cutlet well. Brush with olive oil and bake in the oven or grill on the barbecue for 3 minutes on each side – depending on the size of the cutlets. Serve the lamb with the feijoas and the pumpkin. When the weather turns cool and the fruit starts to fall from the feijoa trees, it’s time to think of soul soothing desserts. This recipe is from the New Zealand Herald archives, and is created by Amanda Laird. More cream please. Roll the pastry out on a floured board to an oblong shape, approximately 25cm by 35cm. Halve the feijoas and scoop out the flesh. Roughly chop and put into a saucepan with the remaining ingredients. Simmer gently for 15 minutes then let cool. Preheat oven to 200°C. Spread the filling on the pastry to within 3cm of the edges on the side but leave more space at the top. Carefully roll up the pastry from the long side then brush the edge with a little water to seal. Melt 1 tablespoon of butter and brush over the pastry then bake for 20 minutes or until the pastry is golden brown. Slice and serve hot with custard or yoghurt. This luscious upside down tart is a French classic, with a feijoa twist. 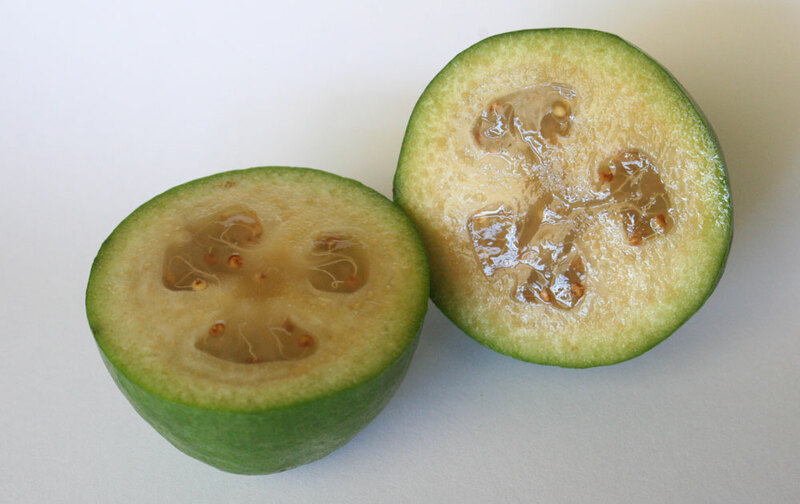 It’s another fabulicious feijoa recipe from Amanda Laird of the New Zealand Herald. And so easy to make. Roll out the pastry on a lightly floured surface, to a 24cm disc. The size of the pastry disc needs to be slightly bigger than the pan being used, in this instance a 20cm ovenproof tarte tatin dish or cast iron frying pan. Refrigerate for 20 minutes. Melt the butter and sugar in the pan then top with the feijoas, cut side down. Cook for 15 minutes. Remove the pan and cover the fruit with the pastry, tucking in down around the edges. Prick the pastry, then transfer to the oven and bake for approximately 20 minutes or until golden and crisp. Remove from the oven and let rest for 5 minutes before running a knife around the edges, placing a serving plate over the pan and inverting. Serve warm with icecream or softly whipped cream. Here’s another delicioso recipe from Amanda Laird of the New Zealand Herald. Peel and chop the feijoas. Put into a saucepan with the cardamom, honey, vanilla and water. Cook gently for 10 minutes or until soft and pulpy. Spoon into a sieve and let cool. Preheat oven to 200°C. Lay the pastry out. Filo dries out quickly so cover with a sheet of foil and then a damp tea towel while preparing. Take one sheet, brush lightly with butter and sprinkle with pistachios. Cover with a second sheet and repeat until you reach the final sheet. Spoon the feijoa along the end of the pastry, keeping an inch free on either side. Fold the edges over the feijoa mixture then roll up. Brush the edge with butter before sealing. Brush the top of the pastry with butter then place on a baking tray and cook for 25 minutes or until golden and crispy. Stir the icing sugar together with the lemon juice and drizzle over the cooled strudel before sprinkling over the rest of the pistachios. Serve with cream or Greek style yoghurt.